The second of two documentaries in New Frontier’s on-screen offerings brings this doc-by-doc look at the 2012 Sundance line-up to a close, just in time for the festival to begin tomorrow: ROOM 237, Rodney Ascher’s playful exploration of the supposed hidden meanings of a genre classic. Ascher is a Sundance alumnus – his last short doc, THE S FROM HELL (2010), employed a similar technique to relate the often hilarious testimony of viewers traumatized by the apparent demonic undertones of the classic 1960s Screen Gems logo. He was also an editor of fest alum WAVE TWISTERS (2001), by Syd Garon and Eric Henry. Ascher’s approach, combining the audio commentary from the various theorists with clips from THE SHINING, other Kubrick films, and other sources, results in an intriguing, accessible, and successful mix between a MYSTERY SCIENCE THEATRE episode and a pop culture lecture. While the film’s purpose hardly seems to be to lend credence to some of the outré conspiracy theories profferred, neither is Ascher holding his subjects up to easy, puerile ridicule. 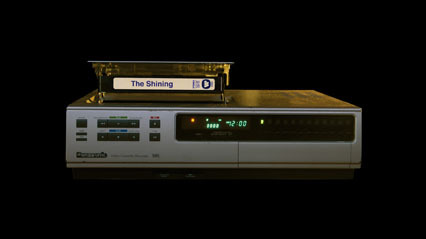 Even if the viewer might scoff at some of their readings, their enthusiasm is infectious enough that the audience will likely want to watch THE SHINING again soon – not to confirm or debunk, but perhaps to try to make sense of what in the film engenders such unusual obsession. At the same time, in refraining from on-screen footage of his subjects, Ascher in a way makes them Everymen. In so doing, he holds the mirror up to the audience, suggesting anyone watching might be, and probably is, in their own way capable of similar levels of engagement, given the right film, TV show, novel, or piece of art. Check out the film’s website and Facebook page. For screening dates and times at Sundance, click the link in the first paragraph.